June 18, 2018: It's the most wonderful time…. in four years! (That should be in tune to a popular Christmas song to hear how it was playing in my head). I love the World Cup. I have always watched it, but this year, it just feels different. I’ve spent 25 years playing this beautiful game, but really only the past four or so have I become a fan of watching it. It’s amazing what you can get out of watching the best players in the world do their thing. They make everything look so easy, when anyone who has ever played can tell you that just aren’t true. If I had a nickel for every time I had a great idea on the field that I just didn’t execute properly… well, I’d have a lot of nickels. One of my least favorite thing about being a football fan is listening to other people commentate on the game. I have this little pub that I go and watch premier league games when I am in Boston, and OH MY GOODNESS I almost have to leave listening to the (mostly men) opining on the play. I’d like to see you go out there and do it. Yes, these guys* make millions (please don’t get me started on the men vs. women pay out), but I’d love to throw someone on the pitch for even a few seconds to feel the effort and precision it takes to put together a 90 minute match. Anyway, I digress. Since the United States is not in competition this year, it sort of makes me enjoy all of the games more, as I don’t have a major rooting interest. And the two countries I’ve lived in outside of the US are Australia and Sweden, and while I can root for them… let’s be honest, it ain’t in the cards. So I can just spectate, without my heart being pulled in one way or the other. And it is amazing! When you watch these teams play, you can absolutely tell the different styles from country to country. Spain excels in the tiki-taka, or lots of short passes and tons of movement off the ball. Players on Brazil, on the other hand, have incredible foot skills and the ability to rely on individual talent. A team like Sweden will play it safe and rely on their defense to keep them in the game. So far, the best game was Spain vs. Portugal. Three goals a pop and a close match, from a spectating side, you can’t really beat the excitement. Along with the joy comes the despair. I truly felt for Christian Coeval from Peru after he completely botched his penalty kick against Denmark (hey, Messi missed too! ), but it was pretty cool to see his teammates rally around him at half time, inevitably telling him that s*** happens and you've got to move on. My heart broke for Aziz Bouhaddouz, the Moroccan defender who scored a (beautiful header) own goal in the very last minute of their game versus Iran. Similarly, I felt for Australia as they put up a hell of a fight against a heavily favored France, only to get scored on in the last ten minutes by Paul Pogba (slash own goal Aziz Behich). As I’ve said before, as it may be the best thing in the world, the game can also be unfair, painful and heartbreaking. It comes with the territory. 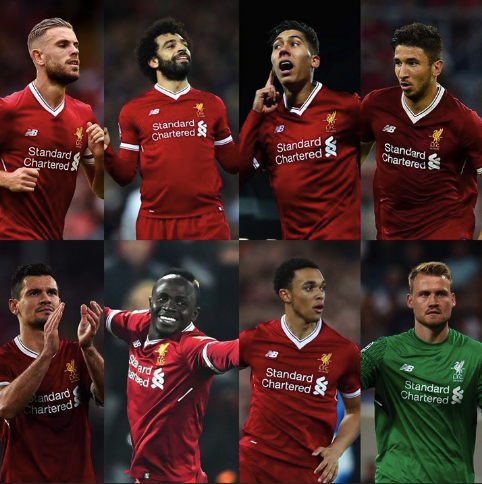 One great thing about Liverpool is that we’ve got eight players competing in the World Cup. I shared this last week on our Instagram page, but it’s worth repeating: Mo Salah (Egypt), Bobby Firmino (Brazil), Dejan Lovren (Croatia), Simon Mignolet (Belgium), Jordan Henderson and Trent Alexander-Arnold (England), Sadio Mane (Senegal), and Marko Grujić (Serbia). So you’ve got plenty of games to tune into, right?! Today, I’ll be on the couch watching and recuperating after my own game. Yesterday, for the first time, we got… um… creamed… by the #1 team in the league, but I got (Wo)man-Of-The-Match, so I can at least hold on to that. I even scored a goal! Unforttttuntely, it didn’t count because allegedly the ball curved out of bounds on the corner before finding my head. Allegedly. I’d like to see the instant replay on that.